GE and Coke are iconic names, but for most investors one of these companies simply isn't worth the risk today. General Electric (NYSE:GE) and Coca-Cola (NYSE:KO) were both founded over 100 years ago. Each is facing headwinds today, but over time they have both proven themselves to be survivors. However, one of these iconic stocks is in a much better position than the other right now. Here's what you need to know to make the choice between GE and Coca-Cola. General Electric's troubles date back to Jack Welch, which might sound like heresy to some. But under his leadership, the industrial conglomerate allowed its finance arm to spread from supporting customer purchases into other, far riskier (in hindsight) areas of finance, like home loans. When the financial crisis hit, pushing the United States into a deep recession between 2007 and 2009, the finance arm turned into a massive trouble spot, which Welch's successor, Jeffrey Immelt, was left to handle. Asset sales, writedowns, a dividend cut, and a government bailout were all part of the equation. 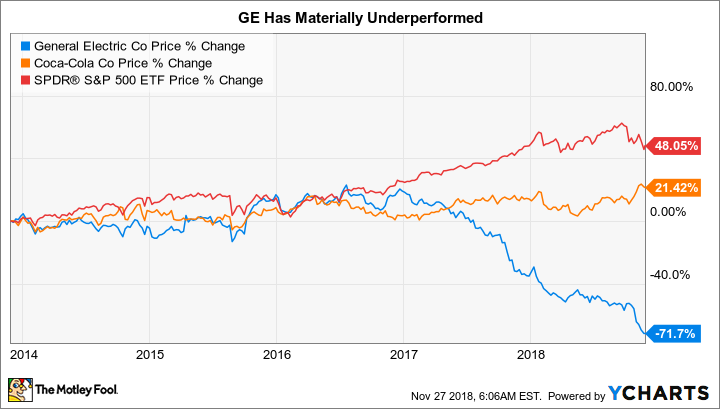 It appeared that Immelt had streamlined GE around its core industrial business, which the CEO started to bolster via acquisitions like Alstom's power business and a majority stake in energy-focused Baker Hughes, a GE Company. Despite the acquisition activity, financial results weren't improving as expected, and in something of a surprise move, Immelt was replaced in 2017 with John Flannery, a longtime company insider. Like his predecessor, Flannery was left with the unfortunate task of reporting that GE was in worse shape than investors thought. The solution was, again, to shed businesses, take writedowns, and cut the dividend. After about a year, the board decided that Flannery wasn't moving quickly enough and replaced him with outsider Lawrence Culp. Bringing in an outsider is a major departure from past practices and suggests that the board thinks big changes are needed. Culp had a long and successful history running Danaher and was a GE board member. The general consensus is that he was a good choice. Culp's first step was to report that GE was in worse shape than investors thought. He followed with a plan to sell assets and take one-time charges, and reduced the dividend to a token $0.01 per share per quarter. The stock has lost more than 70% of its value over the last five years and the price is now lower than it was during the worst of the 2007-2009 recession. Investors are worried that some of the moves Culp is making, such as selling a portion of its Baker Hughes, a GE Company stake, hint that things could be even worse than they appear. In fact, Culp has noted that fixing the balance sheet is a key priority. With long-term debt making up around 75% of the capital structure, that's not surprising. But it is an especially troubling figure for a company operating in the cyclical industrial industry, particularly since the economy seems to be at a high point. General Electric still has important industrial businesses with huge global footprints. A turnaround isn't impossible, but getting from where the company is today to a point where it can start to grow again is likely to be a long process. GE, for all its past glories, is a turnaround story that's only appropriate for more aggressive investors. Most should probably avoid the stock. That is why Coca-Cola is a better option today, though maybe not a great buy, either. This iconic beverage company is facing headwinds, notably including slowing demand for carbonated beverages. It's even seeing a pushback on the government level, with soda taxes popping up in a number of areas to stem consumption of sugary drinks. These are not small issues for a company that's still heavily reliant on soda sales. In fact, Coca-Cola's stock has been a laggard, up only around 21% over the past five years while the S&P 500 gained roughly 48%. That said, Coca-Cola has been adjusting with the times. It has branched out beyond its core soda business, recently buying a European coffee brand, dipping its toes into the alcohol space (after exiting it many years ago), and even holding discussions with a cannabis company. There's always the risk that these moves don't work out, but the company clearly isn't sitting still and allowing the world to pass it by. Perhaps more importantly, Coca-Cola appears financially healthy. Although the top line has been falling, the company should have plenty of leeway to make the adjustments noted above. Indeed, while net income has been relatively weak, gross margin and operating margin remain robust, helping to keep the company solidly in the black. And it sells small products to lots of end customers on a regular basis, which gives its business a solid underpinning even though the top-line has been under pressure. Compared to GE, Coca-Cola appears to be in a much better position to adjust its business. That said, interested investors will want to keep an eye on its balance sheet. Long-term debt makes up nearly two-thirds of the company's capital structure. That's not outlandish when you consider its business, but such a high level of leverage could become a constraint over time if its efforts to expand into new areas don't work out as planned. Still, compared to GE, Coca-Cola's effort to get growth back on track is based on a much stronger financial foundation. The choice between GE and Coca-Cola really boils down to balancing risk and reward. General Electric could turn out to be a highly profitable investment, but only if the latest turnaround effort pans out as hoped. And even then, a business recovery is likely many years away. GE is a high-risk turnaround play today that most investors should avoid. 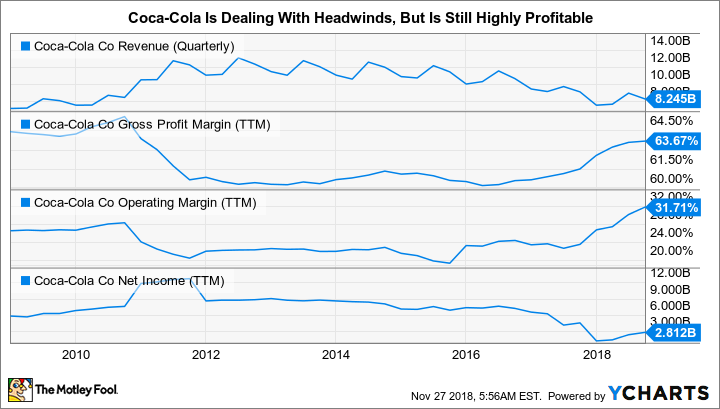 Coca-Cola is also facing some headwinds, but they aren't nearly as substantial. And the beverage company's business tends to be resilient over time, which will allow it more leeway to adjust to changing consumer tastes. It is already making notable moves in this regard. That said, when considering risk versus reward, most investors will probably want to wait until Coca-Cola gets the top line heading higher again. So while Coke is likely a better option than GE today, it's still not a great long-term investment opportunity.